The following information is not intended to be scary or anti-bear in any way. I hope that it will help people appreciate and respect the boundaries required by wild animals. Brown bears are wild animals and they are dangerous. They can and do kill people. California - Peter Lebeck was killed by a grizzly bear he was hunting and had shot on October 17, 1837. The Tejon Pass community of Lebec was named in his honor. California - Jim Boggs was hunting near the Russian River when he was reportedly killed by a sow with cubs. California - Issac Slover was 81 when he shot and wounded a bear near his cabin. He tracked the bear and was killed by it on October 14, 1854. California - Andy Sublette was 46 when he was attacked by a bear he was hunting on December 19th 1854 near present day Santa Monica, CA. He managed to kill the bear with a knife, but died from his injuries 7 days later. Utah - On August 30, 1863, Charles Henery Gates was 35 when he died of injuries he suffered 6 days earlier while attempting to kill a grizzly bear that had been snared in an area where livestock and crop depredation had been occurring in Cache County. There are numerous versions of this grizzly attack. California - According to "Historic Spots in California" William Waddell was killed in what is now Big Basin Redwoods State Park in Santa Cruz County in 1875. Mexico - On June 24, 1892 Hyrum Conrad Naegle died two days after being attacked by a grizzly that he and his brother shot after it had been attacking livestock. Idaho - In 1886 Old Ike was killed by a bear he had shot and wounded. Wyoming - In September 1892 Phillip Henry Vetter was killed by a grizzly near his cabin on Greybull River. Vetter is buried in the Old Trail Town Cemetery. Arizona - August 5, 1895, Mike Kennedy killed by brown bear while walking to the town of Jerome in search of work. Wyoming - Frank Welch was the first documented death from a grizzly bear in Yellowstone National Park. Welch, 61, was a government worker who was killed by a bear known as two-toes because it had lost toes when it escaped from a trap a few year earlier. After Welch's death, his co-workers placed some edible garbage in front of a barrel of dynamite and when two-toes showed up, they blew the barrel up, along with the grizzly. Montana - June 12, 1922 Joseph "Frenchy" Duret was 60 years old when he trapped a grizzly bear, and when he attempted to kill it the bear broke the chain holding the trap and ended up killing Duret. Duret's grave site as well as a near by memorial still stand today. Alberta - Percy Hamilton Goodair was 52 in September of 1929 when he failed to make his weekly scheduled call as a Parks Canada Ranger. The next day a group that was sent to his remote outpost to check on him found his body in the snow near his cabin. He had been killed by a bear around September 12. Youkon - The mutilated body John Macdonald, 70, was found north of Dawson iin October of 1932 and moved to a cabin. A bear broke into the cabin and scattered the remaining portions of Macdonald's body. Wyoming - August 23, 1942 45 year old Martha Hanson was walking from her cabin to the restroom in the Old Faithful area of Yellowstone National Park when she surprised a bear that attacked and badly injured her. Hanson died 4 days later in the Livingston Hospital of injuries received in the attack. Alaska - Willies R. McBride was separated from his hunting partner 50 miles north of Eureka near the big Oshetna River on September 19, 1955. Vic Vukovich, his hunting partner, found his mauled body and reported it to authorities. Montana - Kenneth Scott, 29 was killed on October 22, 1956 when a member of his hunting party was attacked by a bear that was then shot and wounded. When they attempted to track and kill the bear Scott's gun jammed and was was attacked and mauled. Montana - Sam Adams was killed on October 27, 1958 after failing to return from a hunting trip after he split up from his hunting companions. A search party found his dismembered body parts as well as digested clothing, hair and bones in July of 1959 when the snows had melted enough to allow for a through search. Glacier National Park, Montana - August 13 1967, Julie Helgeson, 19, was camping with her boy friend near the Granite Peak Chalet when she was dragged from her tent and killed. Her boy friend was also mauled, suffering serious injuries. Glacier National Park, Montana - August 13 1967, Michelle Koons, 19, was camping with friends at Trout lake when a bear attacked her in her sleeping bag killing her. That same night, 9 miles away a different bear killed Julie Helgeson and injured her boyfriend. British Columbia - Harvey Cardinal, 40, was killed and partially consumed while hunting near the Doig River on January 15, 1970. Tracks showed the grizzly stalked Cardinal from behind and killed him without much struggle. Subsequent necropsy showed bear to have an injured paw, broken teeth and serious gum infection. Wyoming - Harry Walker, 25, was killed by a grizzly on June 25, 1972 at his illegal campsite near Old Faithful Inn in Yellowstone National Park. Alberta - Wilf Etherington was a 51 year old biologist working in Banff National Park when a male grizzly they were relocating charged and attacked Etherington as he was trying to photograph the bear on September 25, 1973. Alaska - Jay Reeves was 38 and camping alone in the Izembek National Wildlife Refuge on August 1, 1974 when his empty and damaged camp was discovered. A helicopter spotted and killed a bear nearby, then the partial remains of Reeves. A necropsy confirmed remains in the bear. British Columbia - Barbra Chapman was 24 when she was killed in Canada's Glacier National Park on July 24, 1976. Attacked while on a hiking trip Chapman's hiking companion was also attacked, but the bear left him after he played dead. Alaska - 25 year old Alan Precup's bear bones and booted feet were discovered near his campsite in Glacier Bay National Park when he didn't return from a backpacking trip. A group of campers reported an aggressive bear, when officials investigated, they discovered Precup's camp and remains. Exact date of death is unknown, probably Sept. 12 or 13th 1976. Alberta - Monty Adams, 32, was mauled by a bear while sheep hunting on September 15, 1976. He was found by two other hunters, but died during his evacuation. Montana - On September 23, 1976, 22 year old Mary Patricia Mahoney was drug from tent at Many Glacier Campground in Glacier National Park while camping with four female friends. Two, 3 year old male grizzlies we subsequently killed close to the area where Ms. Mahoney's body was. Alberta - Alison Muser, 5, was playing in Cameron Creek, Waterton Lakes National Park with her sister when she was attacked by a grizzly on July 1, 1977. She died in Route to the hospital. Montana - July 24, 1980, Jane Ammerman, 19, and her camping companion were both killed and partially consumed at an illegal campsite in the St. Mary Valley of Glacier National Park. A bear killed soon after contained human remains and is presumed to be the bear that killed the pair. Montana - July 24, 1980, Kim Eberly (male), 19 and companion Jane Ammerman were killed and partially consumed at an illegal campsite in the St. Mary Valley of Glacier National Park. A bear killed soon after contained human remains and is presumed to be the bear that killed the pair. Alberta - Ernest Cohoe, 38, was was attacked on August 24, 1980 while on a fishing trip near Banff and died a week later from his injuries. A 10 year old male bear was later killed and positively identified as the attacking bear. Montana - Laurence Gordon, 33 was killed while camping at the Elizabeth Lake Campsite of Glacier National Park about September 30, 1980. Montana - On June 25, 1983 Roger May was dragged from his tent, killed and partially consumed at the Rainbow Point Campground in Gallatin National Forest. A large male grizzly (#15) was trapped at the kill site and determined to have eaten on May. Wyoming - Brigitta Fredenhagen was camping alone near White Lake in Yellowstone National Park on the night of July 30, 1984 when she was attacked in her tent, killed and partially consumed. Wyoming - William Tesinsky, 38, was killed while taking photographs near Otter Creek in the Hayden Valley area of Yellowstone National Park on October 5, 1986. He was apparently killed and partially consumed by sow #59, a bear that had not shown previous aggression to humans, but was known to have been moved numerous times in the past because of habituation. Montana - April 25th 1987, Charles Gibbs, 40, last seen alive following and photographing a female grizzly with cubs in Glacier National Park. Gibbs last took photos of the female approaching at 50 yards. Montana - Gary Goeden, 29, was on a solo, off-trail hike when he was killed and partially consumed near Natahki Lake in the Many Glacier Valley area of Glacier National Park on July 28, 1987. Alaska - July 1, 1995, Marcie Trent, 77, and her son, Larry Waldron, 45, were killed by a grizzly bear defending a moose carcass along the McHugh Creek Trail. Alaska - Harley Seivenpiper, 40, was hunting alone on November 4, 1988 when he was attacked and killed. The bear moved his body about 1 mile to a cache. When searchers approached, the bear charged and was shot and killed. Alaska - on July 10, 1992 Anton Bear, 6, was walking down the road with his mother and six year old sister near the community of King Cove when a bear chased them and grabbed Anton. 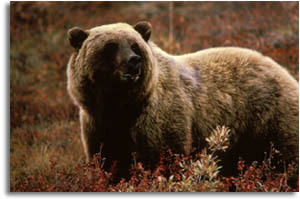 The grizzly had consumed most of Anton before members of the community were able to return and kill the bear. Alberta - Trevor Percy-Lancaster, 40, and his wife were setting up camp in a remote area of Jasper National Park on Sept. 15, 1992 when they startled a bear and began to retreat. The bear grabbed Percy-Lancaster's wife, and when he tried to distract it, it turned on him and killed him. He was partially consumed before wardens could return and kill the 312lb male bear. Montana - On October 3, 1992 John Petranyi, 40, was killed by a sow with two cubs on the Loop Trail near Granite Park Chalet. Petranyi was partially consumed. Alaska - July 1, 1995 a bear attacked and killed Marcie Trent, 77, and her son Larry while they were hiking on the McHugh Creek Trail in Chugach State Park, near Anchorage. Ms. Trent's 14 year old grandson escaped injury by climbing a tree nearby until other people arrived on the scene. A moose carcass was found nearby. Alaska - July 1, 1995 a bear attacked 45 year old Larry Waldron's mother Ms. Trent, while they were hiking on the McHugh Creek Trail in Chugach State Park, near Anchorage. Waldron tried to help her and they were both killed during the encounter. British Columbia - Shane Fumerton, 32, and his hunting partner were attacked and killed on October 9, 1995 near Radium Hot Springs. The pair had killed and elk and taken a self portrait with it before they were attacked. Their bodies were found two days later when a helicopter crew spotted a sow and two cubs eating the elk carcass. British Columbia - Bill Caspell, 40, and his hunting partner Shane Fumerton were attacked and killed on October 9, 1995 near Radium Hot Springs. The pair had killed and elk before they were attacked. Their bodies were recovered four days later when weather allowed. The attacking bears were killed by authorities. Yukon - Christine Courtney, 32 was killed and her husband injured on July 5, 1996 while hiking the Slims Valley Trail in Kluane National Park. The 130 pound male grizzly was killed by wardens. Alaska - August 23, 1996 Robert Bell, 33, was killed while hiking in the Gates Of The Arctic National Park near the Kugrak River when they startled a sow with a cub feeding on salmon. Alaska - February 8th 1998, Audelio Luis Cortes, 40, was killed while working on a seismic crew in the Swanson River oil field near Kenai. Cortes died from a single head bite when the grizzly was apparently awakened in it's den. Montana - May 17th 1998, Craig Dahl, 26, last seen alive hiking in the Two Medicine Area. His partially eaten body was found 3 days latter and the attacked attributed to a sow and two cubs. Alberta - On August 22, 1998, Christopher Kress, 40, was killed while fishing the South Castle River. British Columbia - On October 24, 1998 George Evanoff, 65, was killed by a bear feeding on a moose about 1/2 mile from his cabin. Alaska - May 1999, Kenneth Cates, 53, was found Wednesday morning on a trail in a wooded area of the Kenai National Wildlife Refuge near his hometown of Soldotna. He died of a single bite to the head. Alaska - November 1, 1999, Ned Rasmussen was found two days after he disappeared while on a deer hunting trip. Alaska - July 14th 2000, 41 year old George Tullos partially consumed body was found at the Run Amuck Campground. A 300 pound male bear was killed and Mr. Tullos remains were found in the bear. This was considered a predatory attack. Montana - On October 30, 2001, 50 year old Timothy Hilston was attacked and killed while he field dressed an elk in the Blackfoot-Clearwater Wildlife Management Area. Alaska - October 5th, 2003, Timothy Treadwell, 46, was killed while on an annual bear observation and photography trip near Kaflia Bay in Katmai National Park. Alaska - October 5th, 2003, Amie Huguenard, 37, attacked and killed while on a bear observation and photography trip with Timothy Treadwell near Kaflia Bay. Alberta - June 5 2005, Isabelle Dube, 36, was killed while jogging on a popular hiking trail. She attempted to climb a tree but the bear pulled her from it. The bear had recently been relocated after threatening people in a neighborhood. The 4 year old, 200 pound male bear was later killed by officials. Alaska - June 25 or 26th 2005, Richard (61) and his wife Katherine were attacked and killed in their tent while rafting the Hulahula River in the Arctic NWR, 12 miles up river from Kaktovik. Appears to be a predatory attack by a healthy male bear, 5-7 years old and approximately 300 pounds. Alaska - June 25 or 26th 2005, Katherine Huffman and her husband Richard were attacked and killed in their tent while rafting the Hulahula River in the Arctic NWR. British Columbia - September 20, 2005, Arthur Louie, 60, was attacked and killed by a female grizzly as he was walking back to his mining camp near the Bowron River after his car had gotten a flat tire on a rural road. Yukon - Jean-Francois Page was 28 on April 28, 2006 when he walked within 5 meters of a bears den with two cubs. Alberta - Don Peters, 51, was found 200 yards from his truck on November 25, 2007 three days after he went missing. A sow was trapped April 2008 after she came out of hibernation, and DNA confirmed she was at Peter's body, so she was put down. Her two cubs were also trapped no word on their punishment. Alberta - October 1, 2008, 48 year old Robert Wagner disappeared while on a hunting trip. His body was found about 1/2 mile from his truck near Sundre. Wyoming - Erwin Frank Evert, 70, was attacked and killed in the Shoshone National Forest on June 17, 2010. Evert was killed by a grizzly that earlier that day had been tranquilized and documented by a research team. Montana - Kevin Kammer, 48, was attacked in his tent and killed in Soda Butte Campground, Gallatin National Forest on July 28, 2010. Two other campers were attacked in their tents at different camp sites the same night. A sow and cubs were later trapped at the campground,, the mother was euthanized after it was confirmed she was involved in attack. Wyoming - July 6, 2011, Brian Matayoshi, 57, and his wife were attacked while hiking on the Wapati trail in Yellowstone National Park. Brian died as a result of the attack. Wyoming - August 24, 2011, John Wallace was attacked and killed on Mary Mountain Trail in Yellowstone National Park as he sat on a log eating. The bear that was known to have killed Matayoshi a month earlier was in the immediate area, so it was put down as a precaution. Alaska - Tomas Puerta, 54, was found killed and partially consumed in October 2012 when someone noticed a empty skiff and an aggressive sow with cubs close by. Puerta's body was found cached nearby. Alaska - Richard White, 49, was killed by a male grizzly in Denali National Park. White was taking photos from as close as 50 yards. When his body was found the bear guarding it on August 24, 2012. Alberta - Rick Cross, 54, was killed by a sow with a cub on September 7, 2014. Wyoming - Adam Thomas Stewart, 31, was doing research when he was attacked and killed by what is presumed to be a grizzly bear in September 2014 in the Bridger-Teton National Forest. Northwest Territories - Ken Novotny, 53, was killed by a grizzly after Novotny killed a moose while hunting near Norman Wells on September 17, 2014. Yukon - 42 year old Claudia Huber's, husband was confronted by a bear outside their house on October 18, 2014. He retreated into the house to get a gun, and the bear came in after him. Huber and his wife left the house trying to avoid the attacking bear, and the bear caught Claudia. Huber's husband was able to kill the bear, but the bear killed Claudia. Copyright © 1999 - 2015 Southeastern Outdoors a Division of Southeastern Computer Services.